F. Scott Fitzgerald was only 44 years old when he suffered a fatal heart attack, following years of heavy drinking and various alcohol-related health problems. When he died on December 21, 1940, Fitzgerald had been living in Hollywood, California with his mistress, the gossip columnist Sheilah Graham. After audiences had lost interest in his earlier Jazz Age novels like 1925's The Great Gatsby, he moved to Hollywood to try to make a living by writing screenplays. When Fitzgerald died, his estranged wife, Zelda, was living in a mental hospital in Asheville, North Carolina. She helped arrange for his body to be shipped from California to Rockville, Maryland, so he could be buried with his father, Edward, at the Fitzgerald’s family plot at St. Mary's Catholic Church. St. Mary's, however, refused to accept Fitzgerald’s corpse. The parish priest there told Zelda and Fitzgerald’s lawyer that St. Mary's only buried good Catholics, and Fitzgerald was not considered a good Catholic: He didn’t regularly attend confession, he didn’t take communion, and he was not worthy of being laid to rest on the holy ground at St. Mary’s cemetery. So, Zelda sent her husband’s body to Rockville Cemetery, a less-strict cemetery about a mile away from St. Mary’s. 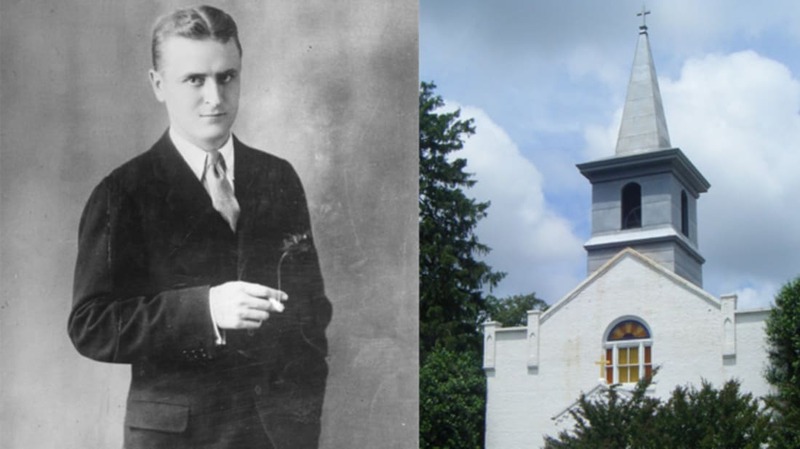 Two dozen people attended Fitzgerald’s rainy funeral service, including Fitzgerald’s only child (his daughter Scottie), and his editor, Max Perkins. Zelda did not attend. Instead of having a Catholic ceremony, Fitzgerald received an impersonal service led by an Episcopal priest who reportedly had no idea who the writer was. After Zelda’s death in 1948, she was also buried at Rockville Cemetery. Because she had bought only one spot in the cemetery instead of a family plot, her casket was buried in tandem, smack on top of Fitzgerald’s casket. In 1975, 35 years after Fitzgerald died, the Rockville Women’s Club and Rockville Civic Improvement Advisory Commission wanted to beautify the Fitzgeralds' run-down grave and put up a plaque to signify their final resting place. They contacted Scottie, who told them how St. Mary’s Catholic Church had rejected her father’s body back in 1940. Scottie, along with members of the Rockville Women’s Club, asked the local Catholic Archbishop to reconsider accepting her parents for burial at St. Mary’s. By then, Fitzgerald’s writing had become far more popular and respected than it was when he died. St. Mary’s happily agreed to let F. Scott's and Zelda’s caskets be moved to St. Mary's for burial in the Fitzgerald family plot. Eleven years later, in 1986, Scottie was buried with her parents at St. Mary’s, and their family’s tombstone is inscribed with the last line of The Great Gatsby.